For the other diesel emissions scandals, see Diesel emissions scandal. VW announces new Clean Diesel cars. Some cars are described in Europe as "EU4 emissions standard (EU5 compliant)". Cars with the test-rigging software are sold in the UK. VW TDI cars go on sale in US. 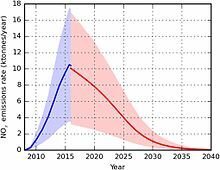 In Europe, some models are now being described as Euro emission class 5, a change from class 4 in 2008. 2 emissions and fuel consumption figures are also affected by "irregularities". The German Federal Motor Transport Authority (KBA) approves VW fixes for 1.2, 1.6 and 2.0 diesel engines in Europe. 2 emissions irregularities, saying that only around 36,000 vehicles are affected. VW US CEO Michael Horn resigns, citing a "mutual agreement" with the company. VW announces that it will offer its US customers "substantial compensation" and car buyback offers for nearly 500,000 2.0-litre vehicles. VW agrees to plead guilty to the emissions scandal and to pay $4.3 billion in penalties. Six VW executives are charged. In connection with the case, Audi CEO Rupert Stadler is arrested in Germany. US SEC alleges that VW AG, Martin Winterkorn, et al. defrauded investors and files suit in N.D. Cal. x in real-world driving. Volkswagen deployed this programming software in about eleven million cars worldwide, including 500,000 in the United States, in model years 2009 through 2015. In 2014, the California Air Resources Board (CARB) had commissioned a study on emissions discrepancies between European and US models of vehicles from the International Council on Clean Transportation (ICCT), summing up the data from three different sources on 15 vehicles. 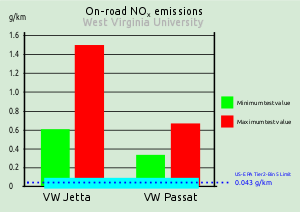 Among them was a group of five scientists at West Virginia University, who detected additional emissions during live road tests on two out of three diesel cars. ICCT also purchased data from two other sources. The new road testing data and the purchased data were generated using Portable Emissions Measurement Systems (PEMS) developed by multiple individuals in the mid-late 1990s and published in May 2014. In 2015, Daniel Dalton MEP delivered the only legislative response to the emissions scandal that will ensure cars are tested on the roads throughout their lifetime. Regulators in multiple countries began to investigate Volkswagen, and its stock price fell in value by a third in the days immediately after the news. Volkswagen Group CEO Martin Winterkorn resigned, and the head of brand development Heinz-Jakob Neusser, Audi research and development head Ulrich Hackenberg, and Porsche research and development head Wolfgang Hatz were suspended. Volkswagen announced plans in April, 2016 to spend €16.2 billion (US$18.32 billion at April 2016 exchange rates) on rectifying the emissions issues, and planned to refit the affected vehicles as part of a recall campaign. In January 2017, Volkswagen pleaded guilty to criminal charges and signed an agreed Statement of Facts, which drew on the results of an investigation VW had itself commissioned from US lawyers Jones Day. The statement set out how engineers had developed the defeat devices, because diesel models could not pass US emissions tests without them, and deliberately sought to conceal their use. In April 2017, a US federal judge ordered Volkswagen "to pay a $2.8 billion criminal fine for rigging diesel-powered vehicles to cheat on government emissions tests". The "unprecedented" plea deal formalized the punishment which VW had agreed to. Winterkorn was charged in the United States with fraud and conspiracy on 3 May 2018. The scandal raised awareness over the higher levels of pollution emitted by all diesel-powered vehicles from a wide range of car makers, which under real-world driving conditions exceeded legal emission limits. A study conducted by ICCT and ADAC showed the biggest deviations from Volvo, Renault, Jeep, Hyundai, Citroën and Fiat, resulting in investigations opening into other diesel emissions scandals. A discussion was sparked on the topic of software-controlled machinery being generally prone to cheating, and a way out would be to open source the software for public scrutiny. In general, three-way catalytic converter technology, which has been very effective since the early 1980s at reducing nitrogen oxide in petrol engine exhaust, does not work well for diesel exhaust because of its relatively high proportion of oxygen. In 2005, parts of VW intended to purchase the rights to Mercedes' BlueTec system for reducing pollution, but other parts of VW rejected that and preferred to develop their own system. x standards when being tested, constituting a defeat device. In 2015 the news magazine Der Spiegel reported that at least 30 people at management level in VW knew about the deceit for years which VW denied in 2015. As of 2014[update], VW was registered with a Corporate Average Fuel Economy (CAFE) of 34 mpg‑US (6.9 L/100 km; 41 mpg‑imp). The low emissions levels of Volkswagen vehicles tested with the defeat device in operation enabled the company to receive green car subsidies and tax exemptions in the US. In 1998, a Swedish researcher criticized the New European Driving Cycle standard for allowing large emission differences between test and reality. The Washington Post also reported that in the late 1990s, EPA engineers at Virginia Testing Laboratory had built a system called ROVER, designed to test a car's emissions on the road. The project was shut down in 2001, despite preliminary tests indicating gaps between emissions from lab tests and real world tests of about 10 to 20 percent. Sensors and electronic components in modern light-duty vehicles are capable of 'detecting' the start of an emissions test in the laboratory (e.g., based on acceleration sensors or not-driven/not-rotating wheels). Some vehicle functions may only be operational in the laboratory, if a predefined test mode is activated. Detecting emissions tests is problematic from the perspective of emissions legislation, because it may enable the use of defeat devices that activate, modulate, delay, or deactivate emissions control systems with the purpose of either enhancing the effectiveness of these systems during emissions testing or reducing the effectiveness of these systems under normal vehicle operation and use. While the use of defeat devices is generally prohibited, exceptions exist in cases where it is necessary to protect the engine against damage and to ensure safe vehicle operation (EC, 2007). These exceptions leave room for interpretation and provide scope, together with the currently applied test procedure, for tailoring the emissions performance [...]. x and particulate matter from 1983 to 2014. Respirable suspended particles with a diameter of 10 micrometres – also known as PM10 (including diesel particulates) – halved since 1996 despite the increased number and size of diesel cars in the UK. The independent body International Council on Clean Transportation (ICCT) commissioned a study in 2014 and obtained data on 15 vehicles from three sources. John German, co-lead of the US branch of ICCT, said the idea for the "very ordinary" test came from Peter Mock, managing director ICCT in Europe. Mr. German said they chose to put US vehicles through on-the-road tests because their emissions regulations are more stringent than those in the European Union. The ICCT expected the cars to pass, and thought they would be able to use the results to demonstrate to Europeans that it was possible to run diesel cars with cleaner emissions. The study found emissions discrepancies in the diesel VW Passat and VW Jetta, and no discrepancies in a BMW X5. They wanted to test a Mercedes as well, but could not obtain one. A group of scientists at West Virginia University submitted a proposal to ICCT, and John German awarded them a US$50,000 grant for a study to conduct tests on three diesel cars: a VW Passat, a VW Jetta, and a BMW X5. ICCT also purchased data from Emissions Analytics, a UK-based emissions consultancy, and from stakeholders in the Real Driving Emissions-Light Duty Vehicle working group in charge of amending Euro 6 regulations. In early 2014, two professors and two students began testing emissions from the three vehicles under road conditions, using a portable emissions measurement system, making it possible to collect real world driving emissions data, for comparison with laboratory dynamometer testing. The three vehicles were all certified at a California Air Resources Board facility before the tests as falling below the emissions limits when using the standard laboratory testing protocols. They put 2,400 kilometres (1,500 mi) on the Jetta and BMW. For their final test, they wanted to put even more mileage on the Passat and drove it from Los Angeles to Seattle and back again, virtually the entire West Coast of the United States, over 3,200 kilometres (2,000 mi). The BMW was "at or below the standard … with exception of rural-up/downhill driving conditions". But the researchers found that under real-world driving conditions the Jetta exceeded US emissions limits "by a factor of 15 to 35" while the Passat exceeded the limit "by a factor of 5 to 20". The emissions far exceeded legal limits set by both European and US standards. One of the testers said, "... we did so much testing that we couldn't repeatedly be doing the same mistake again and again." John German said the deceit required more effort than merely adding some code to the engine software, as the code would also have to be validated. The US test results confirmed the ICCT's findings in Europe. The West Virginia scientists did not identify the defeat device, but they reported their findings in a study they presented to the EPA and CARB in May 2014. In May 2014 Colorado's RapidScreen real-world emissions test data reinforced the suspected abnormally high emissions levels. After a year-long investigation, an international team of investigators identified the defeat device as a piece of code labelled "acoustic condition" which activated emissions-curbing systems when the car's computer identified it was undergoing a test. The VW and Audi cars identified as violators had been certified to meet either the US EPA Tier 2 / Bin 5 emissions standard or the California LEV-II ULEV standard. Either standard requires that nitrogen oxide emissions not exceed 0.043 grams per kilometre (0.07 g/mi) for engines at full useful life which is defined as either 190,000 kilometres (120,000 mi) or 240,000 kilometres (150,000 mi) depending on the vehicle and optional certification choices. This standard for nitrogen oxide emissions is among the most stringent in the world. For comparison, the contemporary European standards known as Euro 5 (2008 "EU5 compliant", 2009–2014 models) and Euro 6 (2015 models) only limit nitrogen oxide emissions to 0.18 grams per kilometre (0.29 g/mi) and 0.08 grams per kilometre (0.13 g/mi) respectively. Defeat devices are forbidden in the EU. The use of a defeat device is subject to a penalty. x treatment listed on page 9.
x pollution, was a mistake. On 18 September 2015, the US EPA served a Notice of Violation (NOV) on Volkswagen Group alleging that approximately 480,000 VW and Audi automobiles equipped with 2-litre TDI engines, and sold in the US between 2009 and 2015, had an emissions-compliance "defeat device" installed. A Notice of Violation is a notification to the recipient that the EPA believes it has committed violations and is not a final determination of liability. Volkswagen's "defeat device" is specially-written engine-management-unit firmware that detects "the position of the steering wheel, vehicle speed, the duration of the engine's operation, and barometric pressure" when positioned on a dynamometer using the FTP-75 test schedule. These criteria very closely match the EPA's required emissions testing protocol which allowed the vehicle to comply with emissions regulations by properly activating all emissions control during testing. The EPA's NOV alleged that under normal driving conditions, the software suppressed the emissions controls, allowing better fuel economy, at the expense of emitting up to 40 times more nitrogen oxides than allowed by law. In February 2017, Der Spiegel reported that in February 2015, ex Israeli diplomat Avi Primor had shown Ferdinand Piëch, then VW chairman of the board at the time, a document in which US agencies warned CEO Martin Winterkorn early about the manipulation. During this meeting at the end of February 2015, Primor introduced Piëch to his friend Yuval Diskin, who after retiring from directing the Israeli secret service of the Interior Shin Bet, had founded a cybersecurity company. Shin Bet apparently knew about the scandal early. Primor confirmed that the meeting took place, but both Primor and Diskin denied tipping off Piech. In early March 2017, Piech asked Winterkorn whether there had been a warning by US agencies, which Winterkorn denied. According to the EPA, Volkswagen had insisted for a year before the outbreak of the scandal that discrepancies were mere technical glitches. Volkswagen only fully acknowledged that they had manipulated the vehicle emission tests after being confronted with evidence regarding the "defeat device". The first sign that Volkswagen was ready to come clean reportedly occurred on 21 August 2015 at a conference on green transportation in Pacific Grove, California, where an unnamed company representative approached Christopher Grundler, director of the EPA Office of Transportation and Air Quality, and surprised him by informally admitting that the company had been deceiving regulators. A CARB official was standing next to Grundler at the time. Formal acknowledgement of the deception was made by Volkswagen executives in Germany and the United States to EPA and California officials during a 3 September conference call, during which Volkswagen executives discussed written materials provided to the participants demonstrating how Volkswagen's diesel engine software circumvented US emissions tests. That admission came after the EPA threatened to withhold approval for the company's 2016 Volkswagen and Audi diesel models. Volkswagen's CEO Martin Winterkorn said: "I personally am deeply sorry that we have broken the trust of our customers and the public." Winterkorn was in charge at Volkswagen from the start of 2008 to September 2015. He attributed the admitted wrongdoing to "the terrible mistakes of a few people". 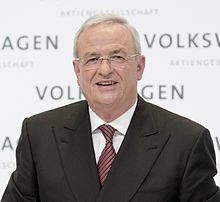 Winterkorn initially resisted calls to step down from his leadership role at VW, but then resigned as CEO on 23 September 2015. Volkswagen Group of America CEO Michael Horn was more direct, saying, "We've totally screwed up." Horn added, "Our company was dishonest with the EPA, and the California Air Resources Board and with all of you." Olaf Lies, a Volkswagen board member and economy minister of Lower Saxony, later told the BBC that the people "who allowed this to happen, or who made the decision to install this software" acted criminally, and must be held personally accountable. He also said the board only found out about the problems "shortly before the media did", and expressed concerns over "why the board wasn't informed earlier about the problems when they were known about over a year ago in the United States". Volkswagen announced that 11 million cars were involved in the falsified emission reports, and that over seven billion dollars would be earmarked to deal with the costs of rectifying the software at the heart of the pollution statements. The newly appointed CEO of VW Mathias Müller stated that the software was only activated in a part of those 11 million cars, which has yet to be determined. The German tabloid Bild claimed that top management had been aware of the software's use to manipulate exhaust settings as early as 2007. Bosch provided the software for testing purposes and warned VW that it would be illegal to use the software to avoid emissions compliance during normal driving. Der Spiegel followed Bild with an article dated 30 September 2015 to state that some groups of people were aware of this in 2005 or 2006. Süddeutsche Zeitung had similarly reported, that Heinz-Jakob Neusser, one of VW's top executives, had ignored at least one engineer's warnings over "possibly illegal" practices in 2011. On 28 September 2015, it was reported that VW had suspended Heinz-Jakob Neusser, head of brand development at its core VW brand; Ulrich Hackenberg, the head of research and development at its brand Audi who oversees technical development across the VW group; and Wolfgang Hatz, research and development chief at its sports-car brand Porsche who also heads engine and transmissions development of the VW group. On the same day it was reported that besides the internal investigation of the incidents, the supervisory board of VW had hired American law firm Jones Day to carry out an independent investigation. Computerworld suggested that a software audit trail and test logs were ways to investigate what took place when. In February 2016 Volkswagen also contracted three public relations firms (Kekst in the United States, Hering Schuppener in Germany, Finsbury in Britain), in addition to its usual US-retained firm Edelman. To further help deal with the scandal, VW hired ex-FBI director Louis Freeh, alongside former German constitutional judge Christine Hohmann-Dennhardt previously employed by Daimler, and as of 2016 on VW's board as its director of integrity and legal affairs. 2 emissions data. The news prompted a 7.3 percent increase in VW preference shares on the same day. 2 emissions during standard testing, thereby also masking the cars' contribution to global warming. x emissions of up to nine times the federal standard". The complaint covers around 85,000 3.0 liter diesel vehicles sold in the United States since 2009, including the Volkswagen Touareg, Porsche Cayenne, Audi A6 Quattro, Audi A7 Quattro, Audi A8, Audi A8L, Audi Q5, and Audi Q7 models. On 29 September 2015, Volkswagen announced plans to refit up to 11 million affected vehicles, fitted with Volkswagen's EA 189 diesel engines, including 5 million at VW brand, 2.1 million at Audi, 1.2 million at Škoda and 1.8 million light commercial vehicles. SEAT said that 700,000 of its diesel models were affected. In Europe alone, a total of 8 million vehicles are affected. In Germany, 2.8 million vehicles will have to be recalled, followed by the UK, with 1.2 million. In France, 984,064 vehicles were affected, in Austria around 360,000, while in the Czech Republic 148,000 vehicles were involved (of which 101,000 were Škodas). In Portugal, VW said it had sold 94,400 vehicles with the software. The repair may not require a formal recall; in the UK, for example, the company will simply offer to repair the cars free of charge; a recall is only required, "when a defect is identified that... could result in serious injury". As the rules violation involved enabling emission controls during testing, but turning it off under normal conditions to improve performance or fuel mileage, it has been speculated that the software update might make cars perform less efficiently and impair fuel economy; according to VW, however, its proposed solutions will be designed to achieve legal EU emissions compliance without impairing engine performance or consumption. As of September 2015[update] it was unclear whether the repair would include hardware modifications, such as selective catalytic reduction upgrades. The recall was scheduled to start in January 2016, with all affected cars projected to be fixed by the end of the year. The company also announced a review of all of its brands and models, including its supercar marque Bugatti. On 8 October 2015, Volkswagen US CEO Michael Horn said in testimony before the US Congress that it could take years to repair all the cars, especially the older models, due to the required complex hardware and software changes. He said that the fixes would likely preserve fuel economy ratings but, "there might be a slight impact on performance". On 12 October 2015, Paul Willis, VW UK managing director, told the Commons Transport Select Committee that about 400,000 Volkswagen cars in the UK will need fuel injectors altered as well as a software fix. The vehicles requiring the hardware fix are the 1.6 litre diesel models. The 1.2 litre and 2.0 litre diesel models will only require a software fix. On the same day, Volkswagen announced it would overhaul its entire diesel strategy, saying that in Europe and North America it will switch "as soon as possible" to the use of selective catalytic reduction technology to improve diesel emissions. It also announced plans to accelerate the development of electric cars and plug-in hybrids, as well as petrol, instead of diesel engines for smaller cars. On 12–13 October 2015, Volkswagen Group vehicle drivers in the UK started receiving notification letters, to "rectify the issue". Volkswagen later announced a timeline for UK diesel recalls, citing March 2016 for 2.0 liter engines, June 2016 for 1.2. liter engines, and October 2016 for 1.6. litre engines. At the beginning of October 2015 VW suggested to let car owners decide whether their cars would be recalled for handling. However, the German Federal Motor Transport Authority (Kraftfahrt-Bundesamt, or KBA) views the software as illegal, and has ordered a full recall of all affected cars in Germany. VW then decided to recall around 8.5 million cars in Europe, about a third of all its car deliveries since 2009. KBA requires VW to send a recall plan to KBA before the end of October for 2.0 liter cars, and end of November for 1.2 and 1.6 liter cars. If KBA approves a plan, VW can then start handling the cars. The German authorities require that VW removes the software and that VW ensures that emission rules are fulfilled. Media estimates that the KBA procedure sets a precedent for how authorities in other countries handle the case. On 18 November 2015, Autoblog reported that the KBA was reviewing a VW fix for the affected 1.6 diesel engine. On 25 November 2015, VW said the fix involved a minor hardware modification to the car's air intake system, alongside a software update. This low-cost solution contradicted earlier speculation regarding the possible fitting of new injection nozzles and catalytic converters. In December 2015 VW said that the affected 1.2 liter and 2.0 liter diesel engines only needed a software update. As of November 2015, the KBA had approved the fixes with the first recalls likely to begin in January 2016. According to VW, the measures aimed to achieve legal EU emissions compliance without impairing engine output, fuel consumption, or performance. The simple fixes with inexpensive parts and software were then possible though not available when the engines were developed, because engine technology understanding and intake flow simulation capabilities had matured in the meantime, to address the burning of diesel and air mixtures via intake flow shaping. As of December 2015, due to stricter environmental legislation, fixes for US vehicles were expected to take longer to produce and be more technically complex. x emissions limit than the passenger cars that are yet to have an available approved fix. German motoring journal Auto Motor und Sport tested two Amarok TDI pickups pre and post software update and found that whilst engine power had remained the same, fuel consumption had increased by 0.5 litres/100 km. This is believed in turn to have delayed the next wave of updates to the larger volume Passat model which had been expected to start on 29 February 2016 due to the further testing of the update by the KBA. Volkswagen confirmed on 11 April 2016 that the Passat recall would be delayed as testing had revealed higher fuel consumption. In 2017 Swedish auto journal Teknikens Värld performed tests on 10 different models and most of them showed a reduction in power output and increase in fuel consumption after having the update applied. In France, the MediaCom media agency, which buys advertising for Volkswagen, warned the French newspapers on 22 September 2015 that it would cancel planned Volkswagen and Audi campaigns in case they would cover the emission violations. Given the scale that the scandal had already taken by that time, the threat had little effect on its coverage. On the occasion of German Unity Day, Volkswagen launched an ad campaign in German Sunday newspapers, that it wanted to express its joy about the 25th anniversary of German reunification, its pride about having shaped the country together with all people for the last 25 years, to give thanks for the confidence of the customers it had experienced during all this time and that it wanted to thank all its employees and trade partners in Germany, and that in one sentence, that "it would do everything to win back the confidence of its customers". In September 2015, Volkswagen's Belgian importer, D'Ieteren, announced that it would offer free engine upgrades to 800 customers who had ordered a vehicle with a diesel engine which was likely to have been fitted with illegal software. As of October 2015, Sales of vehicles with EA 189 engines were halted in some European countries, including Spain, Switzerland, Italy, the Netherlands, Belgium and the UK. 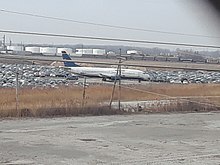 In the United States, VW withdrew its application for emissions certification for its 2016 diesel models, leaving thousands of vehicles stranded at ports in October 2015, which the company said contained software which should have been disclosed to and certified by the EPA. EPA quarantined some 2016-models until it would become clear that their catalysts perform the same on the road as they do in tests. On 8 October 2015 VW US CEO Michael Horn testified before the United States House Committee on Energy and Commerce stating: "This was not a corporate decision, from my point of view, and to my best knowledge today. This was a couple of software engineers who put this in for whatever reason... some people have made the wrong decisions in order to get away with something that will have to be found out." The response was widely ridiculed. On 9 November 2015, Volkswagen announced that 482,000 diesel Audi and VW owners in the United States would be eligible to receive US$1,000 in vouchers, in addition to the US$2,000 it is offering current VW owners for trade-ins. On 18 November 2015, VW said that approximately one quarter of the affected vehicle owners had applied to the program, which was estimated to cost at least $120 million in benefits. VW confirmed that it is offering vouchers including to customers in Canada. VW America said that accepting the gift cards does not prevent owners from filing lawsuits. VW also created a claims fund, managed by the well-known mediation attorney Kenneth Feinberg, which will offer full compensation packages (in the form of cash, buy-backs, repairs or replacement cars) to the approximately 600,000 United States owners affected by the scandal. Despite earlier hints to the contrary, in December 2015 VW CEO Matthias Müller said that customers outside the US and Canada should also expect some type of compensation package: "we are working on an attractive package, let's call it compensation, for reduction in residual values in our cars". However, on 11 January 2016, a VW spokesman said "there won't be compensation. All the indications are that residual values are unaffected"; the company, which continued to face pressure from E.U. officials to compensate European drivers as well, blamed the confusion on "a slight mistranslation". E.U. commissioner Elżbieta Bieńkowska said VW was treating European consumers unfairly, and VW responded that the situation in US and Canadian markets, where confidence in diesel technology was "severely shaken" and clients needed to wait longer for an engine fix due to tougher emissions standards, was not "automatically comparable" with other markets. On 21 April 2016, the federal district court for the Northern District of California, which was appointed in December 2015 to oversee almost all of the US litigation, including claims filed by vehicle owners and state governments, announced that Volkswagen would offer its US customers "substantial compensation" and buyback nearly 500,000 2.0-litre vehicles, as part of a settlement in North America. The court appointed former FBI Director Robert Mueller as a mediator to oversee the negotiations between claimants, regulators, and Volkswagen, to produce a final "consent decree" by late June 2016. A peer-reviewed study published in Environmental Research Letters estimated that approximately 59 premature deaths will be caused by the excess pollution produced between 2008 and 2015 by vehicles equipped with the defeat device in the United States, the majority due to particulate pollution (87%) with the remainder due to ozone (13%). The study also found that making these vehicles emissions compliant by the end of 2016 would avert an additional 130 early deaths. Earlier non peer-reviewed studies published in media sources, quoted estimates ranging from 10 to 350 excess deaths in the United States related to the defeat devices based on varying assumptions. 2 is a precursor to ground-level ozone it may cause respiratory problems "including asthma, bronchitis and emphysema". Nitrogen oxides amplify the effect of fine particulate matter soot which causes heart problems, a form of air pollution estimated to kill 50,000 in the United States annually. A peer-reviewed study published in Environmental Pollution estimated that the fraudulent emissions would be associated with 45 thousand disability-adjusted life years (DALYs) and a value of life lost of at least 39 billion US dollars. In June 2016, Axel Friedrich, formerly with the German equivalent of the E.P.A. and a co-founder of the International Council on Clean Transportation stated "It's not just fraud – it's physical assault." 2 is a precursor to ground-level ozone. In October 2015, the Australian Competition and Consumer Commission announced that it will be investigating VW for possible violations of consumer and safety standards. In March 2017, the Sydney Morning Herald reported that the ACCC had taken Audi and Volkswagen to federal court and that a voluntary recall for affected cars for software updates and in some cases hardware updates had begun in December 2016. As of January 2018[update], several class action suits were under way against Volkswagen, Audi and Skoda. In October 2015, the Belgian Chamber of Representatives set up a special Dieselgate committee. It finalized a consensus report in March 2016, for the government to implement recommendations, with near-unanimous approval on 28 April 2016. In January 2016, public broadcaster Vlaamse Radio- en Televisieomroeporganisatie reported on Opel Zafira cars having lower emissions after an update compared to before receiving the update. Opel denied deploying software updates influencing emissions, and the Economic Inspection of the Federal Government started an investigation on the request of Minister of Consumer Protection Kris Peeters. As of October 2015, Volkswagen Brazil confirmed that 17,057 units of its Amarok mid-size pickups produced between 2011 and 2012 and sold in Brazil were equipped with the emissions cheating software. The Brazilian Institute for the Environment and Renewable Natural Resources (Ibama) launched an investigation, warning that VW could face fines up to R$50,000,000. In September 2017, Volkswagen Brazil was ordered to pay R$1,000,000,000 to the 17,000 owners of the Amarok pickups equipped with defeat devices, as decided by the 1st Business Court of the Court of Justice of Rio de Janeiro. The automaker may still appeal the decision. The total amount reaches R$1,092,648,000 (US$348 million at the September 2017 exchange rate) and each consumer will receive R$54,000 (US$17,000) for material damages and another R$10,000 (US$3,000) for moral damages. In addition, the magistrate ordered the automaker to pay an additional R$1,000,000 into the National Consumer Protection Fund. According to the judge, the purpose was "to compensate the Brazilian society as a collective moral damage of a pedagogical and punitive nature because of the collective fraud caused in the domestic motor vehicle market". In September 2015, Environment Canada announced that it had begun an investigation to determine if "defeat devices" were installed in Volkswagen vehicles to bypass emission control tests in Canada. On 15 December 2016 an agreement was reached which allowed buybacks or trade-ins based on market value on 18 September 2015 or fitting an approved emissions modification. All three options also added a cash payment between CA$5,100 and CA$8,000. Ontario provincial authorities executed a search warrant at Volkswagen Canada offices in the Toronto area on 19 September 2017 as part of its investigation into the emissions scandal that rocked the company two years ago. The Ministry of the Environment and Climate Change have charged Volkswagen AG with one count under the province's Environmental Protection Act, alleging the German company did not comply with Ontario emission standards. The allegations have not been proven in court. In July 2018, Volkswagen Group Canada announced plans for its new Electrify Canada subsidiary to launch a network of public fast-charging stations in major cities and along major highways, starting with 32 charging sites in the four most-populated provinces: Ontario, Quebec, British Columbia and Alberta. In October 2015, China's General Administration of Quality Supervision, Inspection and Quarantine announced the recall of 1,946 imported Tiguan SUVs and four imported Passat B6 sedans, in order to fix the emissions software problems. x ) from 2019 and up to 50% more from 2021. The legislation, opposed only by the Netherlands, is considered[by whom?] a great victory for the car industry, and has drawn stern critique from other MEPs. Dutch MEP Bas Eickhout referred to the new test as "a sham", while liberal democrat MEP Catherine Bearder described the legislation as "a disgraceful stitch-up by national governments, who are once again putting the interests of carmakers ahead of public health". In December 2015, the EU Parliament voted to establish a special committee to investigate whether regulators and executive officials, including the European Commission, failed to oversee the car industry and its pollution testing regimes. In June 2016, documents leaked to the press indicated that in 2010, European Commission officials had been warned by their in-house science team that at least one car manufacturer was possibly using a NOx-related defeat device in order to bypass emission regulation. Kathleen Van Brempt, the chair of the EU inquiry into the scandal, found the documents "shocking" and suggested that they raised serious concerns with regard to the future of commission officials: "These documents show that there has been an astonishing collective blindness to the defeat device issue in the European commission, as well as in other EU institutions". Renault and Peugeot's headquarters were raided by fraud investigators in January and April 2016, respectively. As of January 2016, Renault recalled 15,000 cars for emission testing and fixing. French authorities opened an inquiry in March 2016 into Volkswagen over the rigging of emission tests, with prosecutors investigating suspicions of "aggravated deception". In September 2015 former Volkswagen chief executive Martin Winterkorn resigned over the scandal, saying he had no knowledge of the manipulation of emissions results. One week later German prosecutors launched an investigation against him. On October 1 a German prosecutor clarified, it was looking into allegations of fraud from unidentified individuals, but that Winterkorn was not under formal investigation. On 8 October 2015 police raided VW headquarters. As of 16 October 2015, twenty investigators worked on the case, targeting "more than two, but a lot fewer than 10" VW staff. As of November 2015 the Kraftfahrt-Bundesamt KBA tested 50 cars from different manufacturers, both in laboratory and on-road with PEMS. In May 2016, German transport minister Alexander Dobrindt said that Volkswagen, Audi, Mercedes-Benz, Opel and Porsche would all adjust settings that increased emission levels such as nitrogen dioxide in some diesel cars. On 16 March 2017, German authorities raided the headquarters of Audi in Bavaria and Volkswagen in Wolfsburg. The Hong Kong Environmental Protection Department banned the Volkswagen Caddy on 16 October 2015. As of 16 October 2015 the department had also tested the Amarok and Transporter commercial diesel vehicles but found them to be free of the defeat device. As of 25 September 2015[update], the Indian government directed the Automotive Research Association of India (ARAI) to investigate whether Volkswagen's vehicles had circumvented Indian laws and regulations on vehicle emission testing. On 22 September 2015 the Indian Foundation of Transport, Research and Training (IFTRT) demanded a probe into Volkswagen's Confirmation of Production process for vehicles sold in India. In October the Government of India later extended its deadline for the test results to the end of October 2015. On 11 January 2017, ARAI's investigation into defeat devices was published and revealed that Volkswagen India had installed a derivation of the software used in the U.S. to defeat emission testing procedures in all of the Volkswagen group's product range in India with EA 189 engine series. This included 1.2-L, 1.5-L, 1.6-L and 2.0-L diesel engine variants across three different brands - Audi, Skoda and Volkswagen. The report called the defeat device "not a product failure but a clear case of cheating". On 6 October 2015 Italy's regulator of competition announced plans to investigate whether VW engaged in "improper commercial practices" when promoting its affected diesel vehicles. On 15 October 2015, Italian police raided VW offices in Verona, and VW's Lamborghini offices in Bologna, placing six executives under investigation. In December 2016 the Dutch consumers authority ACM decided to investigate whether Dutch laws were broken and consumers misled, a report was due by June 2017. 5,000 Dutch VW owners have signed up for a class action lawsuit.[when?] Netherlands has spent billions of euros on subsidies in energy-efficient cars in the recent years. [vague] Jesse Klaver from the political party GroenLinks responded[when?] that the Netherlands must claim back money from the car manufacturers if it emerges that they have committed fraud in the Netherlands. Norway's prosecutors opened a criminal investigation into possible economic crimes committed by VW. In May 2016, Norway's sovereign wealth fund, the world's largest ($850 bn) and also one of the company's biggest investors, announced legal action against Volkswagen, to be filed in Germany as part of a class-action lawsuit being prepared there. On 1 October 2015 the Romanian Automotive Register (RAR) stopped issuing registration documents for VW vehicles equipped with Euro 5 diesel engines. On 28 September 2015, the departments of Environmental Affairs and Transport and the National Regulator for Compulsory Specifications said they still needed to determine whether local cars had been affected by the rigging of US vehicle emissions tests. As of 19 January 2016 South Korea, the world's eighth-largest diesel-car market, planned a criminal case against VW executives. On 22 September 2015 South Korean authorities announced pollution control investigations into cars manufactured by Volkswagen and other European car-manufacturers. Park Pan-kyu, a deputy director at South Korea's environment ministry said: "If South Korean authorities find problems in the VW diesel cars, the probe could be expanded to all German diesel cars". In November 2015, after defeat devices had been found in some Volkswagen models, the Environment Minister issued a fine of ₩14,100,000,000 and ordered the cars to be recalled. As of 20 January 2016, the country's environmental agency had filed criminal charges against VW, seeking up to $48 billion in penalties. Johannes Thammer, managing director of Audi Volkswagen Korea, was placed under investigation and faced up to five years in prison and a fine of up to ₩30,000,000. VW's recall plan for South Korea, submitted on 6 January 2016, was rejected by the authorities, as it failed to meet a number of key legal requirements. Authorities are also reported to have rejected a revised plan on 23 March 2016 for the same reasons. In May 2016, following a wider investigation of 20 diesel-powered cars, South Korean authorities accused Nissan of using a defeat device for manipulating emissions data for the British-built Nissan Qashqai, allegations which the Japanese carmaker denied. As of 28 October 2015, a Spanish court had opened a criminal probe against Volkswagen AG, to establish whether the company's actions broke any local laws. As of 29 September 2015, Sweden's chief prosecutor was considering starting a preliminary investigation into Volkswagen's emissions violations. On 26 September 2015 Switzerland banned sales of Volkswagen diesel cars, marking the most severe step taken so far by a government in reaction to the emissions crisis. The Department for Transport announced on 24 September 2015 that it would begin re-testing cars from a variety of manufacturers to ensure the use of "defeat devices" was not industry wide. The UK Parliamentary Transport Select Committee opened an enquiry into Volkswagen Emissions Violations with evidence sessions on 12 October 2015 and 25 January 2016. The Select Committee published a letter from Paul Willis, Managing Director of Volkswagen Group UK Ltd of 21 December 2015 stating: "In very simple terms, the software did amend the NOx characteristics in testing. The vehicles did meet EU5 standards, so it clearly contributed to meeting the EU5 standards in testing". A report on "real world" tests commissioned by the Government published in April 2016 showed emissions from 37 diesel engines up to 14 times higher than had been claimed, with every vehicle exceeding the legal limit of nitrogen oxide emissions. Only Volkswagen group vehicles were found to have test cycle detection software. In January 2017, an action group announced it had 25,000 vehicle owners who were seeking compensation of £3,000-£4,000 per vehicle. In April 2018, new measures to prevent similar scandals secured final approval from MEPs. VW suspended sales of TDI-equipped cars in the US on 20 September 2015. On 21 September 2015 the EPA announced that should the allegations be proven, Volkswagen Group could face fines of up to US$37,500 per vehicle (about US$18 billion in total). In addition to possible civil fines, the United States Department of Justice Environment and Natural Resources Division were doing a criminal probe of Volkswagen AG's conduct. 22 September 2015 The United States House Energy Subcommittee on Oversight and Investigations announced that it would hold a hearing into the Volkswagen scandal while New York Attorney General Eric Schneiderman said that his investigation was already underway. As of 29 October 2015, over 25 other states' attorneys general, and the Federal Bureau of Investigation in Detroit, were involved in similar investigations. On 12 November 2015, the FBI confirmed to engineering magazine Ingeniøren that it had an ongoing investigation, after previous unconfirmed reports. As of 6 October 2015, the EPA decided to broaden its investigations onto 28 diesel-powered models made by BMW, Chrysler, General Motors, Land Rover and Mercedes-Benz. The agency would initially focus on one used vehicle of each model, and widen the probe if it encountered suspicious data. The EPA has described[when?] the hidden VW pollution as "knowing endangerment". In May 2016, the owners of Mercedes-Benz confirmed that the US Justice Department asked Daimler AG to run an internal investigation into its diesel emissions testing, as well. x pollution to exceed EPA's standards during normal driving conditions. It further claimed that VW entities provided misleading information and that material omissions impeded and obstructed ""efforts to learn the truth about the (excess) emissions". while "so far recall discussions with the company have not produced an acceptable way forward". On 9 January 2016, US officials criticized VW for citing German law in order to withhold documents from a group of states investigating the company's actions. Schneiderman also complained over VW's slowness in producing documents from its US files, claiming the company "has sought to delay responses until it completes its 'independent investigation' several months from now". On 12 January 2016, US regulators rejected VW's recall plans for its affected 2.0 liter diesel engines, submitted to CARB in December 2015, claiming that these "do not adequately address overall impacts on vehicle performance, emissions and safety". Volkswagen confirmed that its discussions with CARB will continue, and said that the company is working on bringing "a package together which satisfies our customers first and foremost and then also the regulators". The states of West Virginia, New Mexico, Texas and Harris County, Texas, all filed separate lawsuits seeking restitution from VW. The company also faces investigations by 48 United States state attorneys (as of February 2016[update]). On 29 March 2016, Volkswagen was additionally sued by the United States Federal Trade Commission for false advertising due to fraudulent claims made by the company in its promotion of the affected models, which touted the "environmental and economic advantages" of diesel engines and contained claims of low emissions output. The suit was consolidated into existing litigation over the matter in San Francisco, which would allow the FTC to participate in global settlements over the matter. On 9 September 2016, James Robert Liang, a VW engineer working at VW's testing facility in Oxnard, California, admitted as part of a plea deal with the US Department of Justice that the defeat device had been purposely installed in US vehicles with the knowledge of his engineering team: "Liang admitted that beginning in about 2006, he and his co-conspirators started to design a new "EA 189" diesel engine for sale in the United States. ... When he and his co-conspirators realized that they could not design a diesel engine that would meet the stricter US emissions standards, they designed and implemented [the defeat device] software". On 7 January 2017, former top emissions compliance manager for Volkswagen in the US Oliver Schmidt was arrested by the FBI on a charge of conspiracy to defraud the United States. On 11 January 2017 VW pleaded guilty to weaving a vast conspiracy to defraud the US government and obstructing a federal investigation and agreed to pay a US$2.8 billion criminal fine and US$1.5 billion in civil penalties. In addition, six executives have been criminally charged. On 3 May 2018, former Volkswagen CEO Martin Winterkorn was indicted on fraud and conspiracy charges in the emissions scandal case. He has repeatedly denied any knowledge of the rigged emissions tests. On 25 October 2016, a final settlement was approved by a judge. About 475,000 Volkswagen owners in the US can choose between a buyback or a free fix and compensation, if a repair becomes available. VW will begin administering the settlement immediately, having already devoted several hundred employees to handling the process. Buybacks range in value from $12,475 to $44,176, including restitution payments, and vary based on mileage. People who opt for a fix approved by the Environmental Protection Agency will receive payouts ranging from $5,100 to $9,852, depending on the book value of their car. x trap" and would be harder to repair. In March 2018, Reuters reported that 294,000 cars from the buyback program have been stored at 37 regional US staging sites; some of the first reported sites included: Colorado Springs, Colorado; Pontiac, Michigan; Baltimore, Maryland; San Bernardino, California; and Gary, Indiana. Volkswagen will also pay $2.7 billion for environmental mitigation and another $2 billion for clean-emissions infrastructure. Toward that end, VW formed a U.S. subsidiary called Electrify America, LLC., based in Reston, Virginia, that will manage the $2 billion brand-neutral zero-emission vehicle infrastructure programs and marketing campaigns for the next ten years. The group will get four installments of $500 million, at 2-1/2-year intervals, subject to California Air Resources Board and U.S. EPA approval. VW plans to install hundreds of chargers with 50, 150 and even some ultra-fast 320 kW charge rate, beginning in California in 2017. Competing charge networks (and automakers) saw the effort as controversial. In August 2018, Electrify America launched the first national media advertising campaign to promote electric vehicles; it featured the Chevy Bolt, with other EVs in cameo roles. On 14 March 2019, the U.S. Securities and Exchange Commission filed a complaint against Volkswagen and its former CEO Martin Winterkorn alleging that they defrauded investors by selling corporate bonds and asset-backed securities while knowingly making false and misleading statements to government regulators, underwriters, and consumers as to the quality of their automobiles. By 27 September 2015 at least 34 class-action lawsuits had been filed in the United States and Canada on behalf of Volkswagen and Audi owners, accusing VW of breach of contract, fraudulent concealment, false advertising, and violations of federal and state laws, and positing the "diminished value" of diesels that will be fixed to conform with pollution regulations, due to possible reductions in horsepower and fuel efficiency. According to Reuters, one reason class action lawyers were able to mobilize so fast is that the company's marketing to upscale professionals, including jurists, had backfired. As of 30 September 2015[update], at least one investor lawsuit seeking class action status for holders of Volkswagen American Depositary Receipts had been filed in the United States seeking compensation for the drop in stock value due to the emissions scandal. On 7 October 2015, the Los Angeles Times reported that the number of class-action lawsuits filed had grown to more than 230. On 19 November 2015, ABC News Australia reported that more than 90,000 VW, Audi and Skoda diesel vehicle owners had filed a class action lawsuit against VW in the country's Federal Court. On 8 December 2015, the United States Judicial Panel on Multidistrict Litigation issued an order consolidating over 500 class actions against Volkswagen into a single multidistrict litigation, captioned In re: Volkswagen 'Clean Diesel' Marketing, Sales Practices, and Products Liability Litigation, MDL No. 2672, and transferred the entire MDL to judge Charles R. Breyer of the federal district court for the Northern District of California. On 21 January 2016, Judge Breyer held a hearing on the requests by over 150 plaintiff's attorneys for some kind of leadership role in the gigantic Volkswagen MDL, of which over 50 sought to serve as lead counsel or to chair the plaintiffs' steering committee. More than 100 of those attorneys tried to squeeze into his San Francisco courtroom to argue their requests in person, and some of them had to stand in the aisles or in the outside hallway. That afternoon, Judge Breyer issued an order naming 22 attorneys to a plaintiffs' steering committee, and of those, selected Elizabeth Cabraser of Lieff Cabraser Heimann & Bernstein as chair of the committee. On the other side, Volkswagen hired Robert Giuffra of Sullivan & Cromwell as its lead defense counsel in the MDL. On 14 March 2016, Volkswagen AG was sued in Germany for allegedly failing to inform financial markets in a timely manner about defeat devices used in diesel engines. The suit on behalf of 278 institutional investors seeks €3.3 billion (US$3.7 billion at March 2016 exchange rate) in compensation. BlackRock Inc., the world's largest asset manager, joined other institutional investors in the lawsuit in September 2016. In November 2015, Moody's Investors Service downgraded VW's bond credit rating from A2 to A3. Fitch Ratings downgraded Volkswagen's Long-term Issuer Default Rating by two notches to BBB+, with a negative outlook. In May 2016, The Children's Investment Fund Management, run by Chris Hohn and retaining a 2% stake in VW preference stock, launched a campaign aiming to overhaul the company's executive pay system, arguing that "for years management has been richly rewarded with massive compensation despite presiding over a productivity and profit collapse", thereby leading to an "aggressive management behavior" and contributing to the diesel emission scandal. Later the same month, German investor group DSW called for an independent audit of VW's emissions-cheating practices, arguing that the company's internal investigation might not necessarily make everything transparent to smaller shareholders. On 28 June 2016, Volkswagen agreed to pay $15.3 billion to settle the various public and private civil actions in the United States, the largest settlement ever of an automobile-related consumer class action in United States history. On 25 October 2016, a U.S. federal judge approved the settlement. Up to $10 billion will be paid to 475,000 VW or Audi owners whose cars are equipped with 2.0 liter diesel engines. Owners can also opt to have their car repaired free of charge or can sell it back to the company, who will pay back its estimated value from before the scandal began. Leases can also be terminated without incurring penalty charges. Independent of which options are selected, owners will still receive compensation ranging from $5,000 to $10,000 per affected car. Additionally, should they choose to decline the offer, they are free to pursue independent legal action against the firm. The settlement also includes $2.7 billion for environmental mitigation, $2 billion to promote zero-emissions vehicles and $603 million for claims by 44 states, Washington, D.C., and Puerto Rico. VW agreed not to resell or export any vehicles it repurchases unless an approved emission repair has been completed. As of 28 June 2016[update], no practical engineering solutions that would bring the vehicles into compliance with emission standards had been publicly identified. The consumer settlement will resolve all claims by participating consumers against VW and all its associates, except for any potential claims against Robert Bosch GmbH. Bosch supplied two exhaust treatment components and engine control software. In the case of 3.0-liter V6 TDI engines, VW suggested it can provide an uncomplicated fix that will bring the vehicles into compliance without adversely affecting performance, a move that the company hopes will avoid an expensive buyback of these cars. In January 2016, documents obtained by CEE Bankwatch Network provided more details for a European Investment Bank statement that its loans to Volkswagen may have been connected to the car makers use of cheating devices to rig emission tests. The 'Antrieb RDI' loan was supposedly for creating cleaner drive trains. However, during the bank's annual press conference on 14 January 2016, the bank president, Werner Hoyer, admitted that the €400,000,000 loan might have been used in the creation of an emissions defeat device. Many redacted documents obtained by Bankwatch, along with the EIB not disclosing the details of the loan, hint to the bank possibly already knowing that there were some discrepancies with the 'Antrieb RDI' loan. In 2017, the European Anti-Fraud Office (OLAF) found that Volkswagen had misled the bank about the car company's use of emissions cheating software, in a scandal that has become known as Dieselgate. Also in 2017, Hoyer said the bank did not find "any indication" that its loans had been misused. However, six months later news website Politico reported that Olaf had concluded that Volkswagen acquired the EIB loan through "fraud" and "deception". x emissions between the two standards' limits were readily available at VW headquarters in Germany. According to Müller, the 1.2 and 2.0 liter models may be updated by software, whereas the around 3 million 1.6 liter require various hardware solutions, and some cars may even be replaced. The cars are so diverse that many different solutions are required. Over one quarter of VW's sales in the US are diesel-powered vehicles. The corporation has chosen a market strategy that emphasizes clean diesel over electric cars or hybrid electric vehicles. The EPA revealed on 2 November 2015 that VW had shipped additional diesel models with defeat devices, including the 2014 VW Touareg and the 2015 Porsche Cayenne. Model year 2016 Audi Quattro diesels were also found affected, including several 2016 Audi Quattro models (the 2016 Audi Quattro A6, A7, A8, A8L, and Q5). Cynthis Giles, the EPA Assistant Administrator for Office of Enforcement and Compliance Assurance, called out the company for further refusing to take responsibility for its failure to comply with the law. Under US federal Clean Air Act, VW could be liable for up to $375 million in fines. As of 26 October 2015[update], the resale value of affected model cars in the US was down from 5 to nearly 16 percent depending on model as compiled by Black Book and Kelley Blue Book based on used car auction prices, the volume of which was also down. On 15 March 2016, Volkswagen Financial Services took a writedown of €353,000,000 to cover a potential decline in the residual value of the fleet of its leased cars. 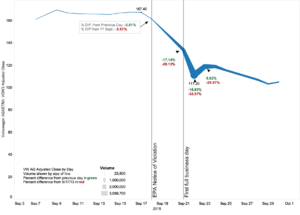 On 21 September 2015, the first day of trading after the EPA's Notice of Violation to Volkswagen became public, share prices of Volkswagen AG fell 20% on the Frankfurt Stock Exchange. On 22 September, the stock fell another 12%. On 23 September, the stock quickly fell 10.5%, dropping below €100 to a record 4-year low before regaining some lost ground. Share prices of other German automakers were also affected, with BMW down 4.9% and Daimler down 5.8%. A year later VW stock was down by 30%. Qatar, one of the biggest VW shareholders with a 17% stake in the company, lost nearly $5 billion as the company stock value fell. The US sale of Volkswagens was 23,882 vehicles in November 2015, a 24.7% decline from November 2014. In South Korea, sales in November rose 66% to 4,517 units from a year ago due to the Volkswagen's aggressive marketing efforts such as a discount of up to ₩18,000,000 (US$15,600 at December 2015 exchange rates) for some models. In Great Britain, the scandal did not affect sales, which increased in 2016 to an all-point high, placing VW second in the league of best-selling cars. VW sales across Europe returned to growth in April 2016 for the first time since the scandal broke, with a group market share of 25.2%, compared to its previous level of 26.1%. x ) by more than 10 times. Researchers have criticized the inadequacy of current regulations and called for the use of a UN-sanctioned test called Worldwide harmonized Light vehicles Test Procedures that better reflects real-life driving conditions. The test is not due to come into force until 2017, with critics saying that car firms have lobbied fiercely to delay its implementation due to the high cost of meeting stricter environmental controls. The VW scandal has increased scrutiny on combustion engines in general, and VW and several other car makes have been shown to pollute more than allowed. A French government report in 2016 investigated 86 different cars, and about 1/5th of those were found to comply with emission laws. Most did not. One car was measured to emit 17 times more than allowed. An overview of tests showed that cars turned off the exhaust improvement device in many ordinary conditions, with 5 out 38 cars complying with regulations in an English test. A German test showed 10 out of 53 cars compliant when exposed to temperatures below 10 degrees Celsius. A French test showed 4 out of 52 cars compliant when tested outside (not in a laboratory). A 2016 test showed VW diesel cars to emit at about twice the Euro6 limit, and several other manufacturers emitting more, up to 14 times higher. Renault believes that diesel cars would become significantly more expensive when re-engineered to comply with new emissions regulations as a result of the VW disclosures, to the point that diesel cars may not be competitive. Industry-wide, small diesel engines are being replaced by bigger ones, and electric car sales have risen. On 16 June 2016, Volkswagen announced plans to make major investments into the production of electric vehicles; Matthias Müller predicted that Volkswagen would introduce 30 all-electric models over the next 10 years, and that electric vehicles would account for around a quarter of its annual sales by 2025. Volkswagen plans to fund the initiative by streamlining its operations and engaging in cost-cutting. Müller stated that the changes would "require us - following the serious setback as a result of the diesel issue - to learn from mistakes made, rectify shortcomings and establish a corporate culture that is open, value-driven and rooted in integrity". VW plans a battery factory near Salzgitter to compensate for the reduced numbers of piston engines. In November 2016, Volkswagen and its labour unions agreed to reduce the workforce by 30,000 people until 2021 as a result of the costs from the violations. However, 9,000 new jobs would come by producing more electric cars. Volkswagen CEO Herbert Diess stated to the German financial publication Handelsblatt that the company planned to stop marketing diesel models in the U.S., citing "the legal framework". In January 2018, it leaked out VW had experimented on monkeys in May 2015 to prove that diesel exhaust was not harmful to primates. The disclosure of the tests was named monkeygate. However, the test car was a VW Beetle fitted with the defeat device that produced far less emissions in the experiment than it would on the highway. VW's top lobbyist, Thomas Steg, was suspended on 23 January 2018. German Chancellor Angela Merkel stated she hoped that all facts in the matter would be made known promptly, urging "complete transparency". She additionally noted that Germany's Transport Minister, Alexander Dobrindt, was in ongoing communication with Volkswagen. The German Green Party accused Merkel of knowing about the defeat devices with a "wink". Michel Sapin, the French Finance Minister, called for an investigation of diesel-powered cars that would encompass the entire continent of Europe. Catherine Bearder, MEP for South East England, commented on 27 October 2015 in the European Parliament that "we now have the political momentum for a radical overhaul that will ensure carmakers cannot dodge the rules", defending an EU resolution meant to specifically "cut deadly pollution from diesel vehicles". However, when the European Commission proceeded with passing legislation that allowed the car industry more time to comply with the newer regulation, while also permitting cars, even under the more "realistic" tests, to emit more than twice the legal limit of nitrogen oxides (NOx) from 2019 and up to 50% more from 2021, Bearder denounced the legislation as "a disgraceful stitch-up by national governments, who are once again putting the interests of carmakers ahead of public health". London Assembly member Stephen Knight suggested on 1 November 2015 that diesel vehicles should either be banned in the future, or face stringent tests before being allowed to enter London's low-emissions zone. The city's deputy mayor for the environment, Matthew Pencharz, responded that such measures could lead to serious economic problems. Major car manufacturers, including Toyota, GM, PSA Peugeot Citroen, Renault, Mazda, Daimler (Mercedes Benz), and Honda, issued press statements reaffirming their vehicles' compliance with all regulations and legislation for the markets in which they operate; The Society of Motor Manufacturers and Traders described the issue as affecting "just one company", with no evidence to suggest that the whole industry might be affected. Renault-Nissan CEO Carlos Ghosn said it would be difficult for an automaker to conceal internally an effort to falsify vehicle emissions data, such as has happened at Volkswagen AG: "I don't think you can do something like this hiding in the bushes." Jim Holder, the editorial director of Haymarket Automotive, which publishes WhatCar and AutoCar, opined that there had never been a scandal in the automotive industry of this size. A commentary in Spiegel Online argued that the VW scandal will affect the entire German industry, and that German companies operating abroad will face a decrease in competitiveness. Alan Brown, chairman of the Volkswagen National Dealer Advisory Council, commented on the scandal's negative impact on US dealers, who were already struggling with overpriced products and a deteriorating relationship between the company and the dealer body. Car and Driver similarly emphasized VW's inability to efficiently operate in the US market, while also suggesting that the company had grossly underestimated the EPA's power, and inexplicably failed to go public before the story broke, despite receiving ample warning. Tesla Motors CEO Elon Musk was asked about his opinion whether the scandal will weaken the consumer's view on green technologies; he responded saying he expects the opposite to happen: "What Volkswagen is really showing is that we've reached the limit of what's possible with diesel and petrol. The time has come to move to a new generation of technology." 2 emissions and strong presence in the US pickup– and commercial–truck segments. On 29 September 2015, S&P Dow Jones Indices and RobecoSAM stated that Volkswagen AG's stock will be de-listed from the Dow Jones Sustainability indexes after close of trading on 5 October 2015. Among the reasons for the de-listing, the statement issued by RobecoSAM cited social and ethical reasons, and confirmed that VW will no longer be identified as an Industry Group Leader in the "Automobiles & Components" industry group. In early October, Green Car Journal rescinded its Green Car of the Year awards, for models that "best raise the bar in environmental performance", that were given to the 2009 VW Jetta TDI and 2010 Audi A3 TDI models. In December 2015, a group of business and environmental leaders, including Tesla CEO Elon Musk, addressed an open letter to CARB, urging the agency to absolve VW of recalling the 85,000 diesel vehicles affected by the scandal in the US, and argued that VW should instead be asked to allocate resources to an accelerated rollout of zero-emissions vehicles ("cure the air, not the cars"). The letter, which includes a 5-step legally enforceable plan, argues that this course of action could result in a "10 for 1 or greater reduction in pollutant emissions as compared to the pollution associated with the diesel fleet cheating", while suggesting that the affected vehicles on the road in California "represent an insignificant portion of total vehicles emissions in the State" and "do not, individually, present any emissions-related risk to their owners or occupants". Similar requests were put forward by the American Lung Association, who petitioned the EPA to determine Volkswagen to promote zero-emissions vehicles, build sustainable transport infrastructure and retrofit older diesel models with superior emissions controls. Volkswagen got a 2016 Ig Nobel Prize in chemistry from the scientific humor magazine Annals of Improbable Research for "solving the problem of excessive automobile pollution emissions by automatically, electromechanically producing fewer emissions whenever the cars are being tested". The Volkswagen TDI emissions scandal has received widespread negative media exposure, with headlines fronting the websites of multiple news gathering and reporting organizations. Reuters said that the crisis at Volkswagen could be a bigger threat to the German economy than the consequences of the 2015 Greek sovereign debt default. Deutsche Welle, one of Germany's state broadcasters, said that a "lawsuit tsunami" was headed for Volkswagen and that the scandal had dealt a blow to the country's psyche and "Made in Germany" brand. Popular Mechanics said that the scandal "is much worse than a recall", highlighting that Volkswagen had engaged in a pattern of "cynical deceit". The Volkswagen emissions cheating scandal has joined the ranks of other -gate suffix stories, with media coining both 'dieselgate' and 'emissionsgate' to describe it. Despite the scandal, one poll conducted for Bild suggested that the majority of Germans (55%) still have "great faith" in Volkswagen, with over three-quarters believing that other carmakers are equally guilty of manipulation. Similarly, a poll conducted by the management consultancy Prophet in October 2015 indicated that two-thirds of Germans believe the scandal to be exaggerated and continue to regard VW as a builder of "excellent cars". A survey by Northwestern University's Kellogg School of Management, Brand Imperatives and Survata said that nearly 50% of US consumers had either a positive or very positive impression of Volkswagen, while 7.5% had a "very negative" impression. Another US survey by market researcher AutoPacific found that 64% of vehicle owners do not trust Volkswagen and only 25% of them have a positive view of Volkswagen following the scandal. This page is based on the Wikipedia article Volkswagen emissions scandal; it is used under the Creative Commons Attribution-ShareAlike 3.0 Unported License (CC-BY-SA). You may redistribute it, verbatim or modified, providing that you comply with the terms of the CC-BY-SA.